In the olden days of 16 bit computing, most programming languages saved their projects in a single binary format. In short: all the files pertaining to your project was housed in a single file. The benefits were of-course that making backups was easier, and it was also easier to keep track of a project. But still, i do miss being able to save an entire project – and I mean everything – in a single file. It was so easy when sending a project to a friend to just ship one single file (today we use SVN naturally but still), and also so much easier when making backups. You have a projects folder that contain X number of project-files, rather than a folder containing thousands of files, including the SVN revisions. With OP4JS I’m bringing this old trend back. 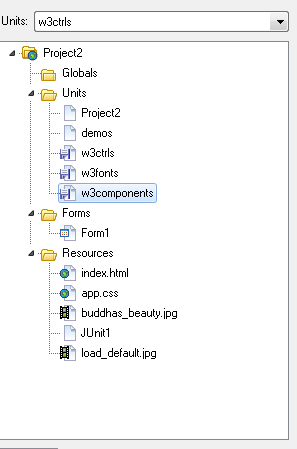 So you can finally mix and match between the “normal” way of organizing your project (one file per unit + project file + dependencies) or the old school “packaged” way (all files stored inside the project file). You can also keep some files resident and others external. Good if you want to share a unit with someone or just downloaded something from the net. Under vanilla Delphi you don’t import files, you reference them (explicit or implicit). I made a small twist to this concept so that if your project contains a file with the same name as an RTL file – it will always use that instead. 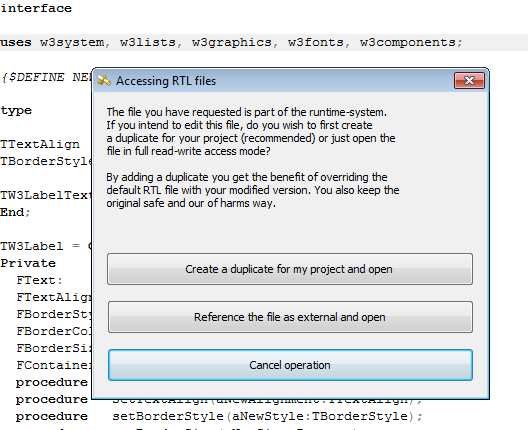 If you chose to open an RTL file you are always given the option to create a duplicate – inside the project file. That way you can create your very own version of the RTL file without screwing up the system. It’s also invaluable during the development of new RTL files and bug-fixing the system. What we do here is to first get a handle to the our tag (the tagRef is a public property of TW3TagObject, the class TW3CustomControl inherits from). 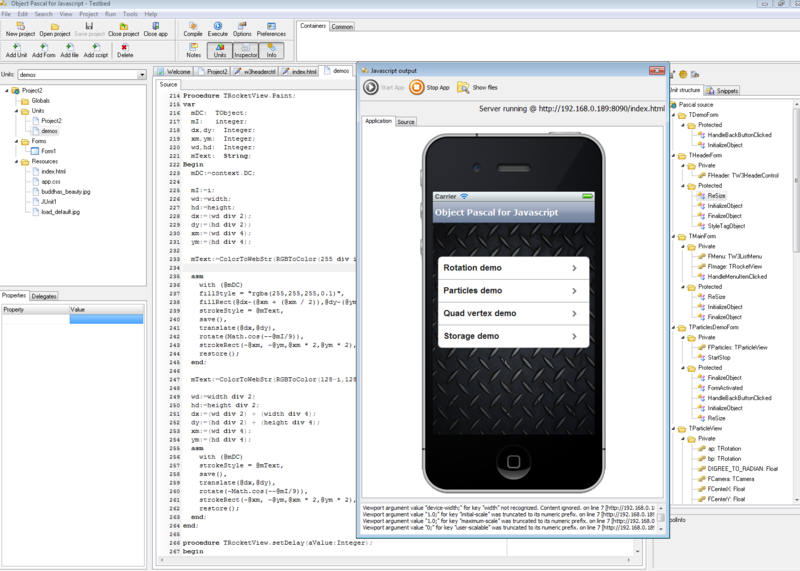 We then enter the ASM section, use that reference to access and alter the width style property. Ofcourse you dont have to deal with this stuff unless you want to, because OP4JS will ship with a rich set of controls ready to be used. And rolling your own controls is so simple it’s almost ridicules. Where did my pointers go? But, all the standard types are there: string, boolean, float, integer and so on. You also have records, interfaces and enumerations to play with. It really is a neat system once you get the hang of it. OP4JS is getting near to completion for each day that passes. We are currently implementing the final project types which are: console and gaming. Yes you read right – console. 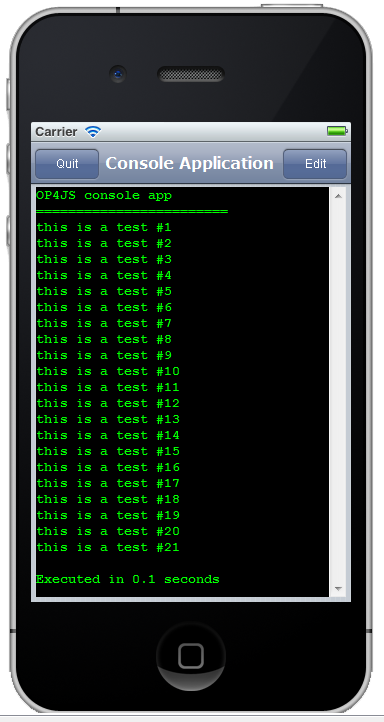 A console application under OP4JS is basically a visual project, but where an instance of TW3Console occupies the majority of the screen. It is meant for testing purposes (for now) where you want a quick and easy project type just to test out theories and play around with routines that doesn’t require forms. The generic gaming project type is very simple, basically it puts safari mobile into full-screen, plasters a canvas in the view-port and uses a high-speed timer to force maximum redraw-rate. It is up to you to load in pictures and draw them using the methods in the canvas object. Since i have coded a lot of 2d platform games earlier, you can expect to see a game library coming out as soon as the product has shipped. In fact it’s one of the things i’m eagerly looking forward to working on.